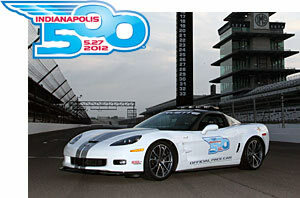 After a three year hiatus, the Corvette returns in 2012 as the Official Pace Car for the 96th Indy 500. The 638-horsepower ZR1 is the most powerful production car ever to lead the Indy 500. And with a sticker price of for than $120k, it may likely be the most expensive. 2013 marks 60th anniversary for the iconic American sports car. Celebrity chef Guy Fieri will pilot the pace car for the start of the race. As in 2002, the 2012 Indy 500 will use a pace car from the 2013 model year. Also similar to 2002, the pace car uses the standard 60th Anniversary package—Arctic White exterior with Pearl Silver Blue racing stripes and Diamond Blue interior—and adds the 2012 Indy 500 logo and other badging. GM has not announced any plans at this time to make a pace car replica available to the public. However in 2003, Chevrolet did eventually make a decal package available to owners of 50th Anniversary Edition coupes and convertibles. While it is somewhat surprising that GM chose not to use a convertible model, such as the 2013 Corvette 427 convertible, the recent trend has been to use a coupe even when a convertible model is available. This is most likely for safety reasons. The Corvette will be supplemented by a fleet of 2012 Chevy Camaro SS convertibles, which will be used for the 500 Festival Parade and by VIPs and speedway executives.